In Pakistan, an old wooden bridge collapsed underneath in a fast-moving river in Kashmir killing 5 people and 11 are missing. 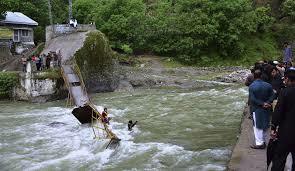 Javed Ayub, a senior tourism department official in Pakistani-administered Kashmir said that 14 students were rescued after the bridge collapsed and still searching for 11 more who missing. "We hope for the best but it will be unlikely to find the remaining (students) alive as the water flow is very high," said Ayub. Kashmir is split between Pakistan and India, both of which claim the Himalayan region in its entirety.